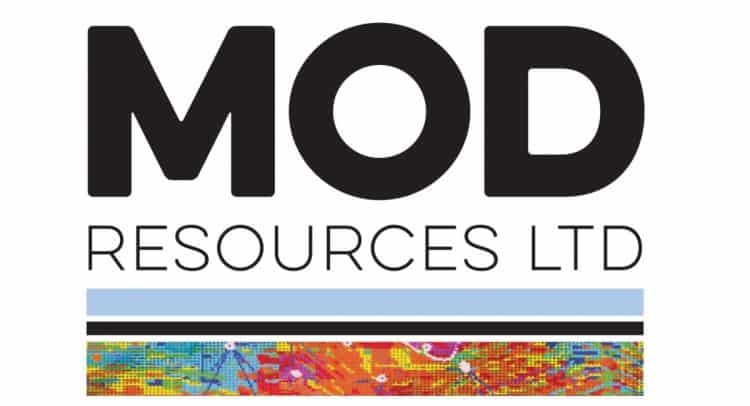 On 21 January 2019, MOD Resources Limited (Company) announced that it would be offering shareholders the opportunity to participate in a non-renounceable pro-rata entitlement offer to raise approximately $5.2 million (before costs) (Offer), on the basis of one fully paid ordinary share in the capital of the Company (New Share) for every 13 fully paid ordinary shares held at the record date, at an issue price of $0.24 per New Share. The Offer is fully underwritten by Ashanti Capital Pty Ltd (Underwriter) and sub-underwritten by Australian Super Pty Ltd.
Only shareholders with a registered address in Australia, New Zealand, Hong Kong, Singapore, Switzerland or the United Kingdom will be eligible to participate in the Offer (Eligible Shareholders). The Offer is made to Eligible Shareholders registered at 5.00pm (Perth-time) on the record date of Monday, 4 February 2019 (Record Date). Assuming no options are exercised before the Record Date, up to 21,685,073 New Shares will be issued under the Offer. As a non-renounceable offer, rights are not tradeable on the ASX or otherwise transferable. New Shares will rank equally with the Company’s existing shares. The Offer will be made by way of an offer document pursuant to section 708AA of the Corporations Act 2001 (Cth) meaning that no prospectus needs to be prepared (Offer Document). The Offer Document will be available on the Company’s website at www.modresources.com.au and on the ASX website at www.asx.com.au on Wednesday, 30 January 2019. The purpose of this letter is to give you notice, as an option holder of the Company, that if you wish to participate in the Offer in relation to the shares underlying your options, you must exercise your options before the Record Date. 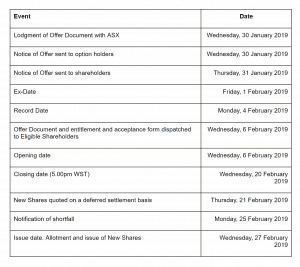 Notice of exercise of your options and payment of the exercise price of the options must be received by the Company’s share registry, Computershare Investor Services Pty Ltd, on or before Friday, 1 February 2019. Any notice of exercise of options received after this date cannot be assured of the allotment of shares by the Record Date. If you require an option exercise form, please contact the Company Secretary on +61 (08) 9322 8233. There is no obligation for you to exercise your options. This letter is intended to inform you of your rights in relation to your options and the Offer. If you do not wish to participate in the Offer, you do not need to take any action. Please do not hesitate to contact us should you require anything further. Successful completion of the Offer will raise up to approximately $5.2 million (before costs). The Company has also completed an equity placement to raise a total of $10 million (less associated costs). The placement involved the issue of 33,333,333 shares at an issue price of $0.30 per share and was undertaken within the Company’s existing Listing Rule 7.1 placement capacity (Placement). The funds raised through the Placement and the Offer are to be used to progress the T3 Copper Project through the Feasibility Study and towards production, provide working capital to fund exploration activities to define additional resources within the surrounding T3 Expansion Project area, as well as test regional priority targets to further assess the potential copper-belt scale opportunity of the under-explored Kalahari Copper Belt. The above timetable is indicative only and all dates may be subject to change. MOD Directors reserve the right to extend the Closing Date for the Offer at their discretion and in consultation with the Underwriter. Should this occur, the extension will have a consequential effect on the anticipated date of issue for the New Shares. If Eligible Shareholders do not wish to take up any part of their entitlement they are not required to take any action. Eligible Shareholders may not apply for any shortfall shares. Any entitlements not taken up pursuant to the Offer will be dealt with in accordance with an underwriting agreement with the Underwriter as detailed in the Offer Document. Details of the Offer will be contained in the Offer Document. Eligible Shareholders should consider the Offer Document carefully before deciding whether to participate in the Offer and consult with their professional advisors if they have any queries.